Random House Books for Young Readers, 9781524771478, 288pp. When twelve-year-old June Harper's parents discover what they deem an inappropriate library book, they take strict parenting to a whole new level. And everything June loves about Dogwood Middle School unravels: librarian Ms. Bradshaw is suspended, an author appearance is canceled, the library is gutted, and all books on the premises must have administrative approval. 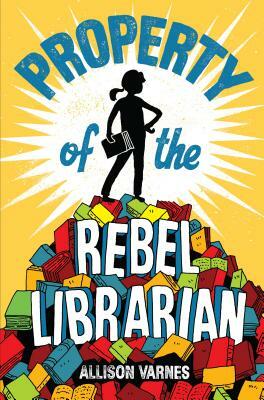 Like librarian Ms. Bradshaw in Property of the Rebel Librarian, Allison Varnes has fought for her students. She taught English in special education for eight years and once had to convince administrators that The Lion, the Witch and the Wardrobe is not an endorsement of witchcraft. She's from a family of teachers and has a PhD in education from the University of Tennessee. And like heroine June, Allison is a former marching-band geek. When she's not writing, she howls along to the Hamilton soundtrack with a trio of Chihuahuas named after Peanuts characters. Find her on Twitter at @allisonvarnes or on Facebook at facebook.com/allisonvarnesauthor.